Have you seen the hilariously adorable "Dear Kitten" commercials from Purina Friskies? They've been making the social-media rounds and, if you're like me, you've watched each one about a dozen times. In the four commercials (I say "commercial," but the advertisement is incredibly subtle), the senior cat of the house is teaching the new kittens the ropes when it comes to living in his new home. The cat goes over important lessons like how to deal with the dog, living with humans, and the mysteries of the mirror (or as the cat says, "window that's lower than the others") and the cats who live on the other side of the "window." Coincidentally, those cats are total doppelgangers of the cats looking through the "window." Crazy, huh? You can see all the videos here, but this one is my favorite. It's the older cat's sage advice on interacting with the dog. 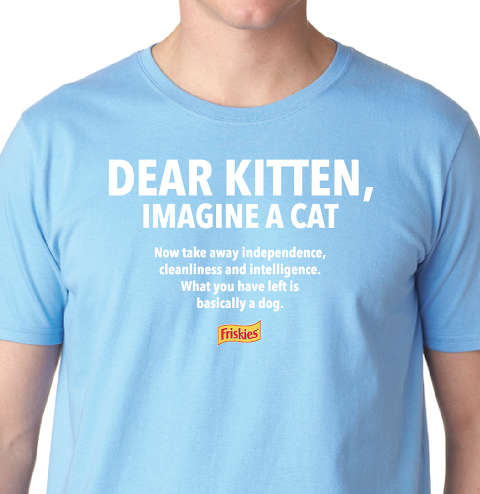 As if the videos aren't enough, there are "Dear Kitten" shirts -- and Catladyland and Friskies are giving away ten of them! 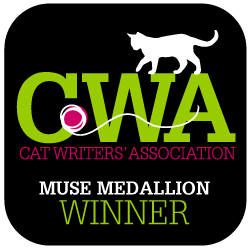 If you'd like to be one of the ten winners, please register via the Rafflecopter widget. After you click to enter, you'll be asked for your name, and email address. No one sees this information but me -- promise! Please remember to place all the information on the same line. If you enter before including all the info, Rafflecopter won't allow you to edit your entry. Just leave me a comment on this post and I'll make sure you're entered. Purina Friskies is providing the T-shirts for this giveaway; we were not compensated for this post. Catladyland only shares information and products we feel are relevant to our readers. Purina Friskies is not responsible for the content of this post.